It was a late winter afternoon. Most of the people have already left the office or were about to do so. I was heading to my lab after having a tasty late lunch in our cafeteria. (Ok, I should call it just the late lunch.) I was hoping to get an hour or two of a lone, quiet work time, to finish one of my supreme visualizations. To my surprise, when I entered the lab I have noticed that there is someone in, sitting by my desk. Me: You must be me, but from the future. Stranger: Yes, you are right. Stranger: Be quiet and listen. I do not have much time here… or should I say – now. I came to warn you about a serious mistake that your company is about to make. In 2014 you have started an important project. It was called “Project Wombat”. Me: Yes, I know this project. It has started about a half a year ago. We are now to provide estimates for the remaining work, before signing the long-term contract. Stranger: This is why I came. The estimates you will provide will be terribly wrong. This will end the cooperation with the customer. What’s more, the entire company will feel hugely embarrassed. Many good people will leave and others will lose their spirit. In grief, many people will start to dress formally, stop making jokes and the company atmosphere will die. It will take many years until the company regains its strength again. Me: But we have our good way of estimating the remaining work in projects. 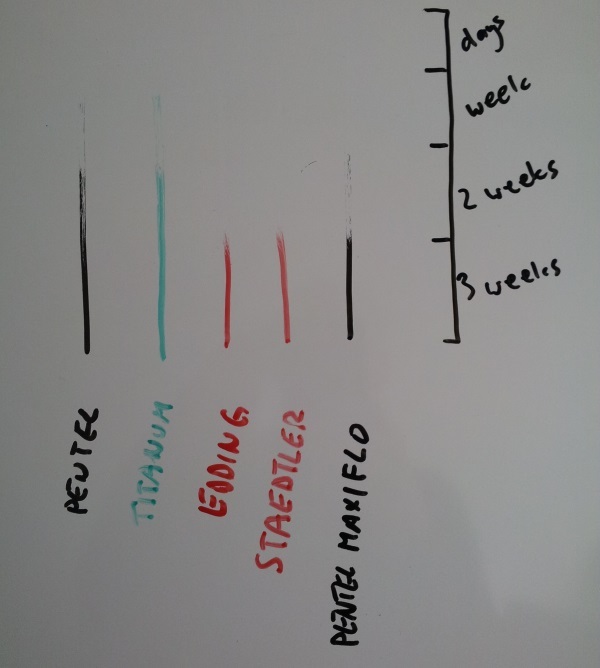 We calculate an average of the story points delivered during already finished iterations. Then we check how many story points there is still to deliver. We divide the two numbers and we know how many iterations we still need to finish. Stranger: What? Are you a moron? You calculate an average and estimate one number? A man and a dog have 3 legs on average! One number… So tell me, what is the chance that you will hit exactly this estimate? What is the chance of hitting +10%? + 20%? +50%? +200%? Is it probable? Is it impossible? By presenting one number you can make more harm to your customer than by telling nothing. They might believe you and assume that the estimate is accurate. Me: Well… When we need a range, we sometimes take two numbers: the number of story points delivered in the worst iteration and the number for the best iteration. 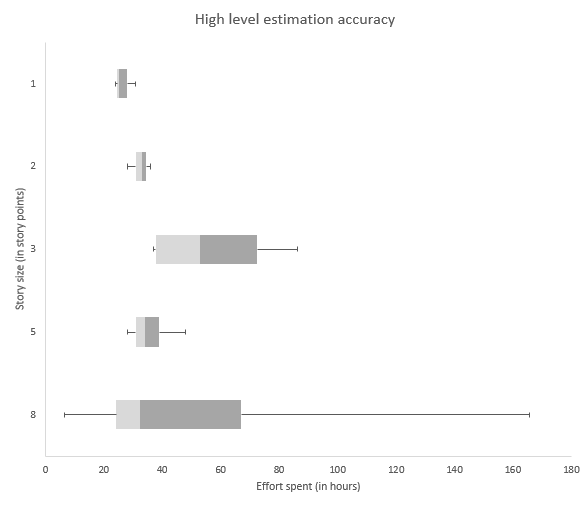 We calculate two estimates of finishing: optimistic and pessimistic. Stranger: Are you joking? And you call yourself a data scientist! So you take two completely unusual iterations and calculates two estimates that are almost impossible to be correct. You are modelling two situations where either everything goes ideally or everything goes terribly. It is not very useful, I must say. Maybe stop bothering with calculations and just say “we will finish between 0 and 1000 iterations”? You will give the similar value to your customer. Me: So maybe you could just tell me what the correct estimate are? Stranger: I can’t. It has something to do with preserving time continuum or something. I cannot give you any precise information from the future. But I can motivate you to better use what you already have. Me: Pity, I was hoping that you will tell me what company I should invest in. We need to gather historical data about the team’s estimates and assess if they are good enough for drawing conclusions. We need to gather historical data about amount of work the team was doing per iteration and check how variable this was. 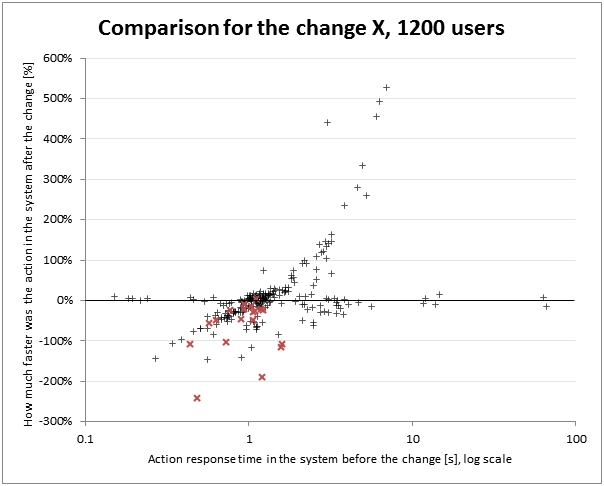 Finally, we need to use the historical data to estimate the effort needed to implement the remaining scope. And we need to visualise this properly. 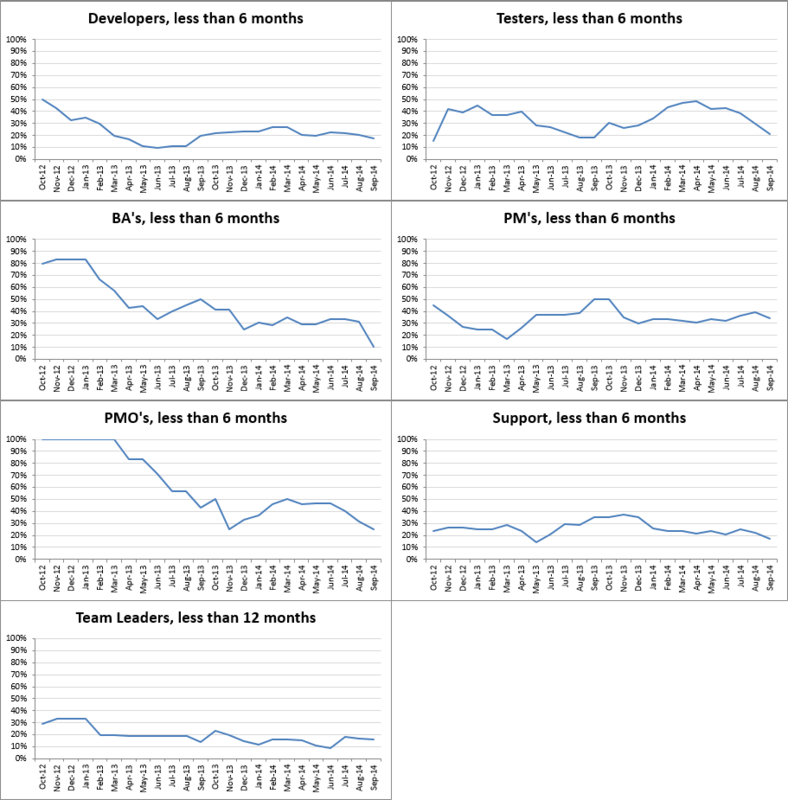 As you can see, for every finished user story we have we have gathered both the estimate in Story Points and the effort spent on implementing it (in hours, including bug fixing time). We also know in which sprint the story was done. This is very useful, as usually teams work much slower during a few first iterations (people learn the new domain, how to cooperate with new team members, etc.). 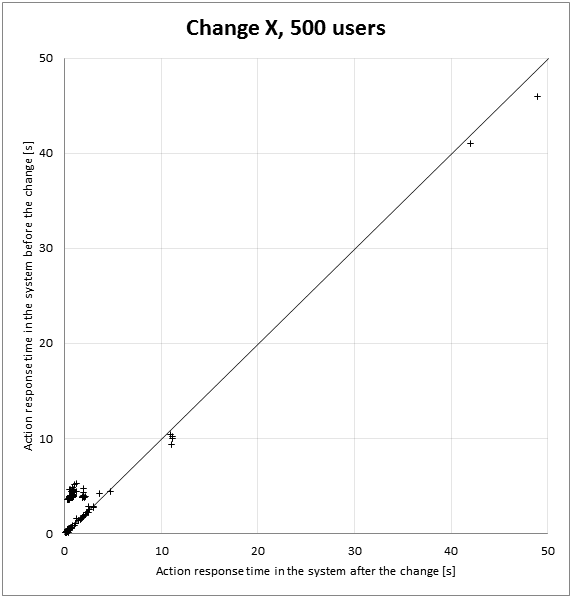 As this initial lower efficiency should not happen in the following iterations of the project (unless the team composition changes significantly) the data from the initial iterations should be excluded from the data set. This was the case also in our project, so we excluded the user stories from the first three sprints. 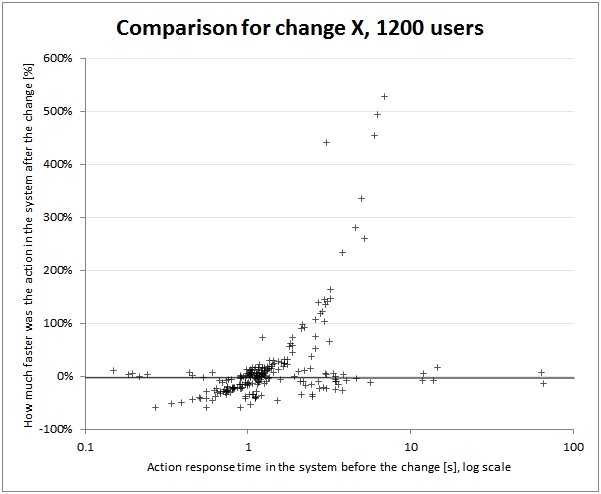 On the graph you can see seven boxplots, one for each possible size of user stories (the vertical axis shows: 1, 2, 3, 5, 8, 13 and 20 Story Points). 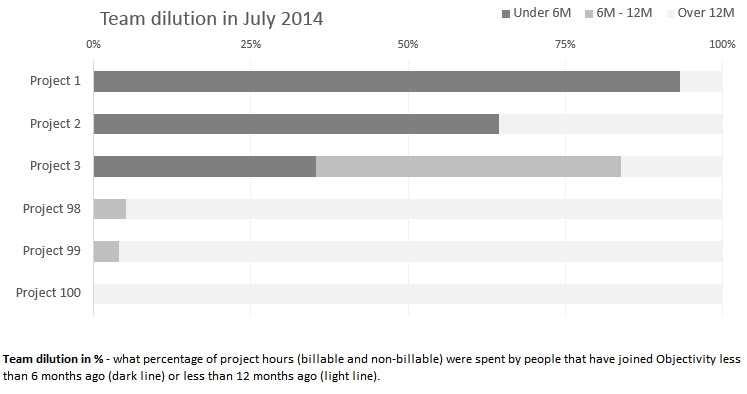 On the horizontal axis we have worked hours. Each boxplot describes the distribution of the worked hours needed to finish stories of its size. E.g. 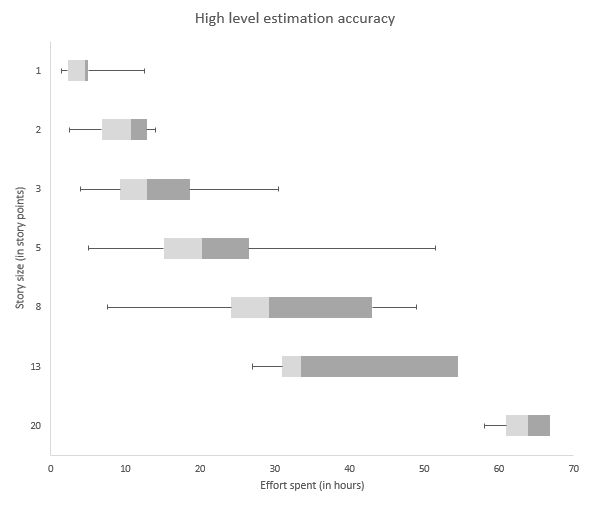 the boxplot for the size 3 SP shows that among all the finished stories of this size, the minimum effort needed was 5 worked hours, maximum was 30 hours, the median was 12 hours and 1st and 3rd centile were 9 and 18 hours. 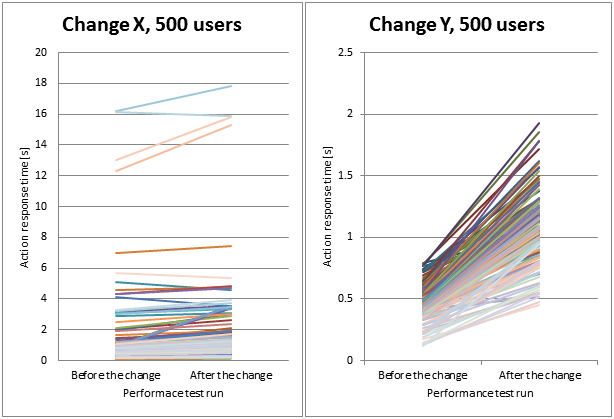 In this case the team did not have a sufficient understanding of the user stories when the estimates were created. The order of the distributions is wrong. Most of the “fives” are smaller than most of the “threes”. “Eights” have enormous distribution. One’s and two’s are very similar. You could not base any sensible prognosis on such data. The team should throw away all the high level estimations of the remaining backlog and once again discuss and assign sizes to the stories. The proper data about the effort per size would be available after a few sprints the earliest. Fortunately, the data in our project were good enough. (The width of the spreads could have at least two reasons: the team could have too little information about the scope or they were not good at estimating in this project yet. Additional analysis could help to distinguish between the two reasons, but this is a separate story.) The next step was to look at the second side of the coin – the team’s capacity. To a huge surprise of every fresh project manager (including me at one time), the software project teams do not only write code (!). They spend time on meetings, communication, estimates, deployments, spikes, playing table soccer and many more. 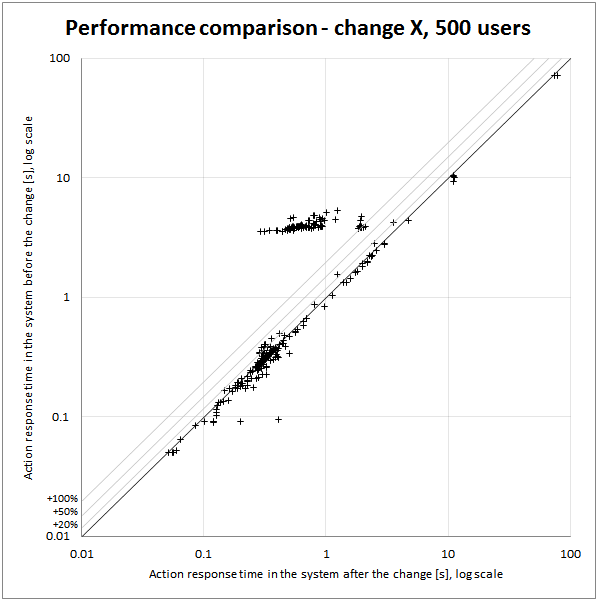 To understand how much time is really spent on the user stories work, you must gather proper data (believe me, you will be surprised when you do this). Once again we were lucky. The Project Wombat’s PM was gathering such information every sprint. 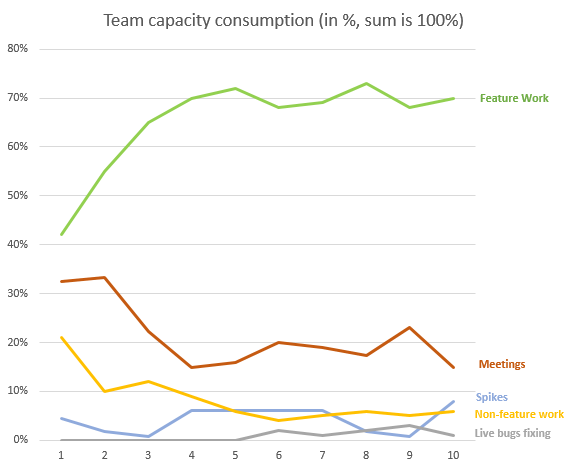 The visualisation below shows the split of the sprints’ capacity on different categories. Calculate the sum of the efforts chosen for all the remaining stories. 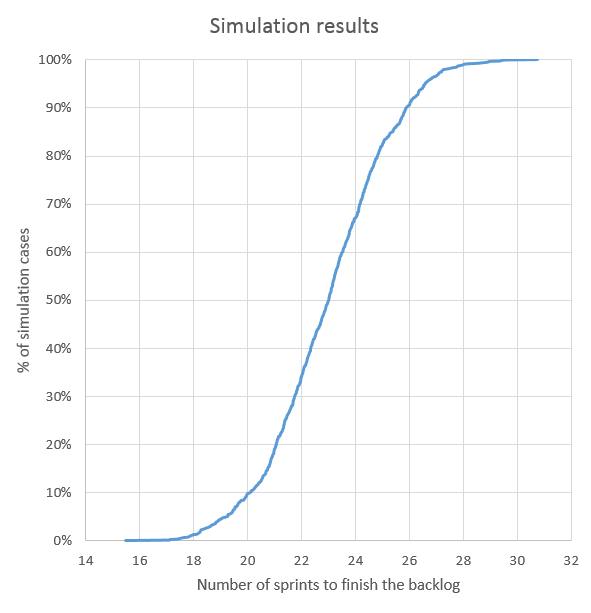 Check how many sprints are needed to cover the sum of efforts with the expected feature work hours. As you can see, the chart allows to pose very quantifiable statements about the estimate. Not only we can tell that the average estimate is 23 sprints (which means that in 50% of cases the project will take less and in 50% of cases it will take more). We can also tell a lot about what is probable and what is not. We can say that there is very small chance (less than 10%) to finish the project in less than 20 sprints. On the other hand, we can say that there is very high chance (more than 90%) to finish the project in less than 26 sprints. This allows to draw informed conclusions about the budget that must be secured for the project and about contingencies that should be made. Once again, the world has been saved. The conversation with the customer went marvellous. The estimates were understood and accepted. The team has rushed into implementation. However, I could not resist the feeling that we were lucky to have all that data. What if we didn’t gather them from the beginning? Could we make better estimates without them? Unfortunately, the answer will have to wait to another post. One of the perks of being a Data Scientist is that you are able to attend to interesting conferences to look for new ideas and trends. I have just come back from ITxpo, the major Gartner’s event prepared for the IT world. The amount of stuff presented there was overwhelming. This time I would like to share with you just a few ideas from one particularly interesting session about the latest research on human brain. To put things simply, human brain is not very good at long distances. The presented research show that a regular, healthy adult person can achieve around 3 hours of high performance brain work per day. After using this time, the ability to focus on tasks drops, IQ decreases and you need more time to accomplish work items. I think all of us know the state, when work just do not get done as quickly as it could. two days of very hard work (a few hours of overtime) in a row (also a 10% IQ drop was measured). Basing on the above, I wanted to propose to you three simple things that you can try yourself tomorrow. Move your stand-up / daily scrum / daily meeting to the end of the day. in the end of the day you should be able to remember what you were doing during the day, so it would be easier to properly choose your next actions. For sure there are other advantages and disadvantages of afternoon stand-ups – please share your thoughts in comments. If the weather allows, change your office meeting into a walking meeting. This way you will not only regain some of you high-performance potential. Also all the participants will reduce their stress level a bit, so the meeting will be more effective. And if this is not possible (e.g. due to the arctic wind), you can always use stairs instead of the elevator a few times a day. Shut down the evil candy machine. Do not increase your glucose level by eating sweets. This will give you a short energy kick but you will get worse very quickly. Choose a fruit or some vegetables. You can give back all your chocolate bars to your local Operations Research lab. They will know how to cope with the threat. I do not expect to survive too long after this post. If I will not get lynched by the people defending their right to candies, I will for sure get captured and tortured by the Agile Coaches due to my heresies about moving the morning stand-up to the afternoon. At least I will have a chance to have a little run when they will be chasing me. So, in case you will never hear from me again, Good Bye and Good Luck. This was a regular morning on a regular Wednesday. I was heading to my lab (which is really a standard office that I share with one very talkative guy… a “lab” sounds more professional, though), when I heard a heart-breaking cry from one of the rooms. When I looked inside I saw a terrible scene. 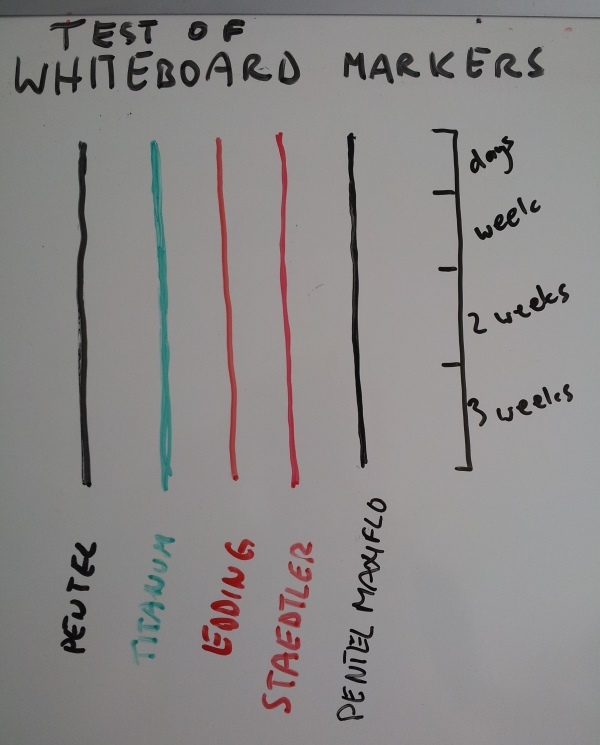 One of my colleagues was shouting at his whiteboard, cursing it, its manufacturer, the markers, their manufacturers, and their entire families to the third generation. While doing this, he was furiously trying to wipe the whiteboard, without achieving any greater effect than stains on his shirt and hands. I realised that I had become a witness of the greatest drama that can happen in the office during daylight hours – permanent marker on a whiteboard. Coming back to the story. When I saw the poor guy I expressed my condolences and invited him to join the ITAATPMYF quest. To my surprise, he said that he was not using the permanent marker, but the whiteboard one. I had to check myself and indeed, only a part of the paint was vanishing while wiping. It’s true, the eraser was not a premium one, but still it should have worked! What the hell? 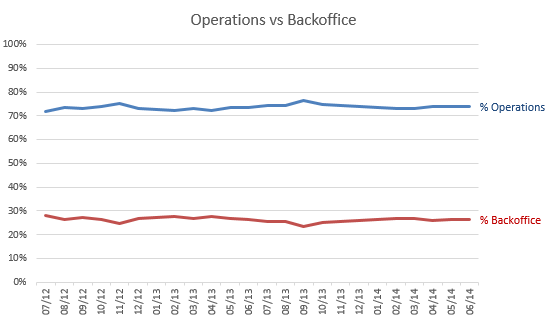 I realised that this was exactly the kind of case for the Operations Research department. I put on my white coat and focused on this as a matter of priority. After short interrogation it was revealed that the whiteboard drawing was made two weeks ago, with a regular black Pentel marker. I started to wander around the office in search of old drawings. Whenever I spotted one, I was erasing it immediately (some people were trying to stop me but they were clearly underestimating the power of the determined scientist). Some drawings were easy to erase, others didn’t come off at all. It was difficult to draw any conclusions as people, instead of providing useful facts about which markers were used and the age of the drawings, were usually babbling something about their lost whiteboard notes. It was clear that I need to make an independent experiment. I drew 5 lines, each using a different kind of marker: Pentel, Titanum, Edding, Staedtler and Pentel Maxiflo. 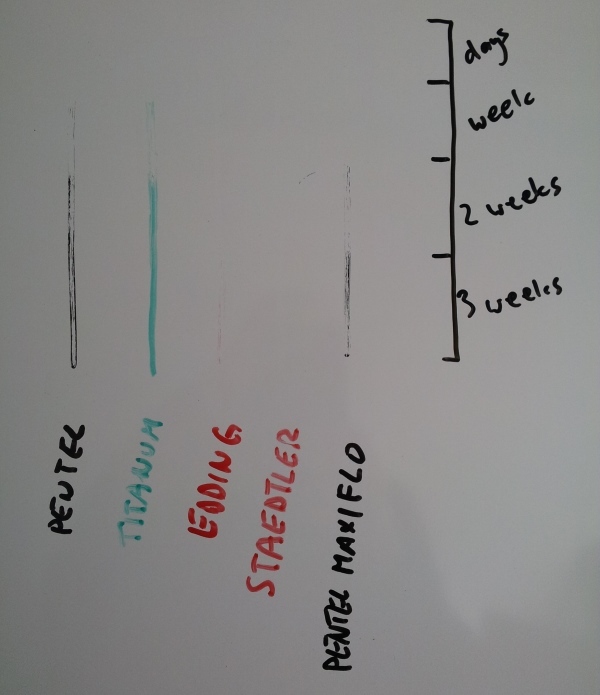 Then I started to erase a part of each line after certain periods of time: two days, 1 week, 2 weeks and finally 3 weeks. I was erasing using a moderate strength of action, wiping only once. After three weeks Pentel Maxiflo was also difficult to wipe. Edding and Steadtler performed the best, with a small advantage going to Steadtler as Edding has left a minor trace of the last piece of line. As I am expecting to be sued by the marker manufacturers in the next 24 hours, I need to admit that the markers are not the only factor in the experiment. It could be that the results are valid only for my particular whiteboard or my particular eraser. The colour impact would also have to be considered. However, as I have chosen the most common board and eraser in my company, my conclusion is that using red Staedtler markers would save us from quite a few office dramas in the future.